You guys! I’ve been keeping quiet about this GIANTIC #pinchme moment for waaaaay to long! 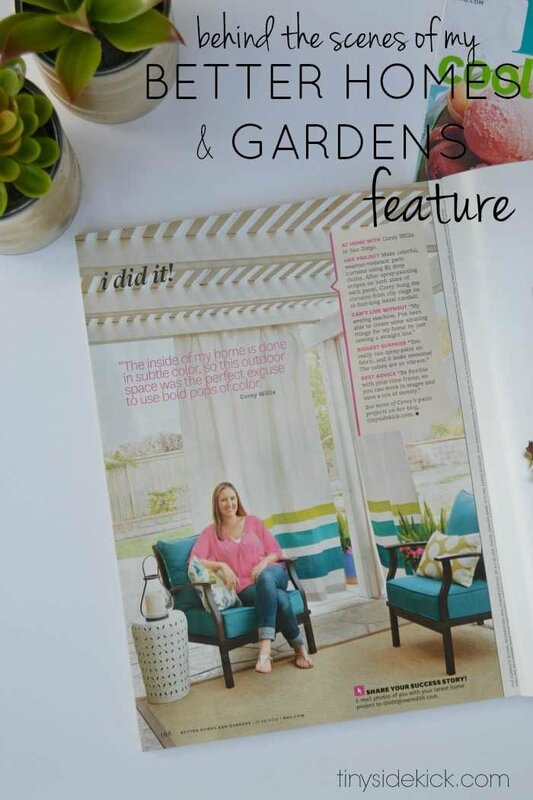 My work made it into the June 2015 issue of Better Homes and Gardens and I could not be more excited! Who knew that last summer when I spruced up my outdoor living space that Better Homes and Gardens would be contacting. Totally blown away. I’ll be honest, I did write down “be featured in a magazine” as one of my goals for 2015, but never in one ba-zillion years did I think it would be a national magazine like this. It was an experience for the record books of this little blog, so today I want to take you on a little behind the scenes journey of how I even ended up there, and what it was like the day of the shoot. Say whaaaaaat??? Not gonna lie, I almost peed a little. 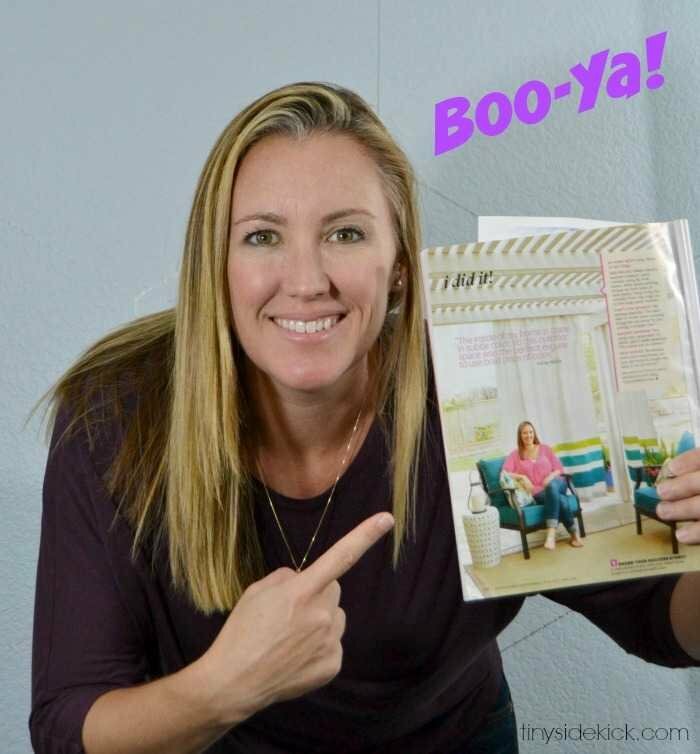 The email went on to say that they would like to feature my outdoor curtains in the June issue of BHG in the “I did it” section. They would send a photographer and stylist to my house. The catch was that they would need to come in about a week. So over the next few days I had a phone meeting with both the photographer and stylist. I had to take photos of my outdoor space every hour all day for the photographer so that he could see where the sun was going to hit at what time so we could plan accordingly. I also took photos of some outfit options for the stylist and we talked about what I should and shouldn’t wear. I had never thought so much about an outfit before. I also had to get my back yard ready. Good thing I had some helpers! 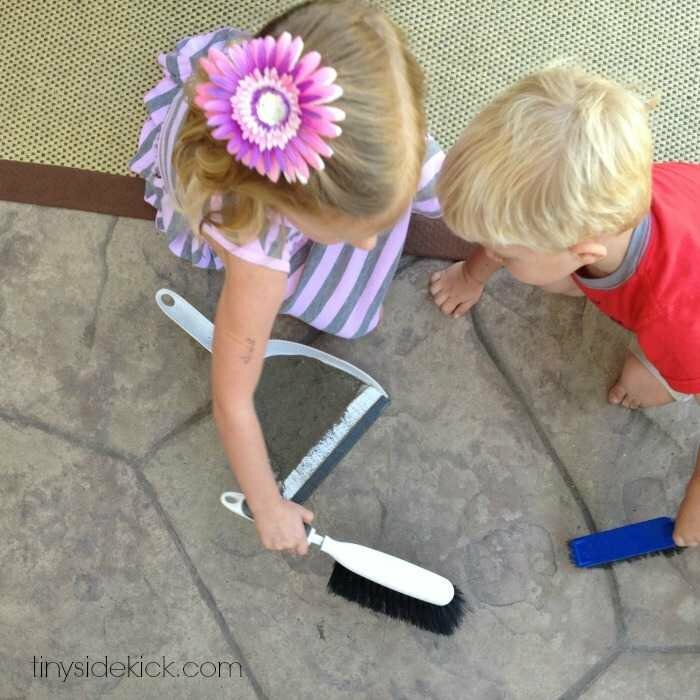 Look at all of that dirt on my patio! They wanted to use my pots in the shoot so I needed to give them some love. The big day was March 9th. The stylist came at about noon and we decided on a final outfit. She even brought me some fun sandals and some jewelry to wear for the photos. 🙂 My biggest worry was that I was going to end up wearing something that I would never wear in real life, but that didn’t happen at all. She was awesome and really cared that I was comfortable and looked like me. She also added a bit of color to my outdoor pots and got the scene ready for the photographer. The plan was to shoot at about 1:30 and then do a video shoot with my kiddos in it. So my dear hubs took the kids out for most of the day so that they wouldn’t get in the way. When they came back they weren’t really sure what to think. So many lights and cameras! But the crew was awesome and let them peek at what he was doing and after shooting a ton of pictures, I got to sneak a peek too. My little lady was definitely thinking it was all very cool. 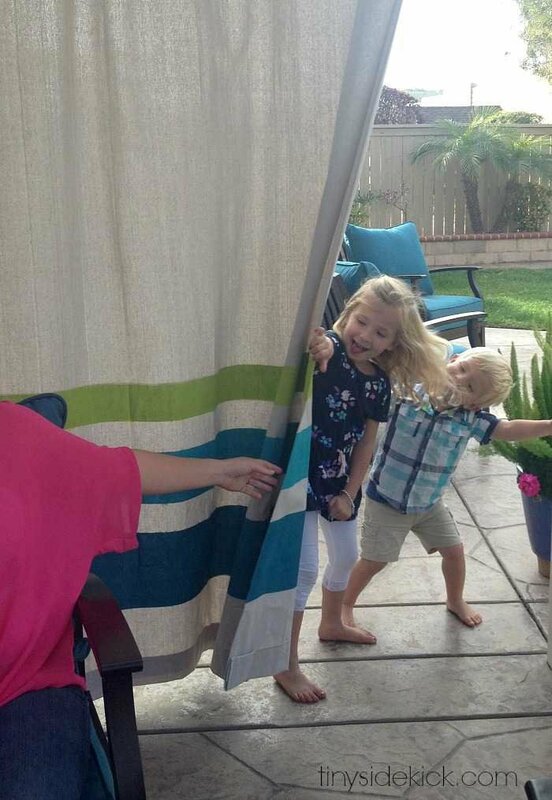 For the video portion, which is online, they wanted my kids coming through the curtains. It took a few tries to get them without a completely goofy look on their faces, but they thought it was really fun to play in the curtains. She is definitely the ham in the family and definitely wanted to be her own director. I didn’t start this blog expecting to get so into it, but it has been a crazy fun journey and I’ve had the opportunity to meet some really great people along the way. I put a lot of heart into this space online and of course it is always nice to have your hard work recognized. So this goes out to all of you hard working bloggers out there that are constantly striving to put amazing and creative ideas out into the world. You have all inspired me to do great things! Cheers! HI Corey, this is too funny! I was chatting with my friend, Melissa Turner, tonight about our home and little renovations that we have done. She told me that I needed to check out your blog! I just about cracked up when I saw both of your Better Homes features. I totally saved this issue because of your feature and my mom used it to create outdoor curtains in her garden this summer. Little did I know that you live down the street! That is crazy to me! You are a local celebrity. 🙂 Hope to bump into you sometime at the park with your cuties. I would love to chat all things home with you! Too fun. Thanks for all of the inspiration. Hey Meghan! What a small world!!! Aniko, yay I am so happy for you to be featured in BHG. Love the colors and the summery look these picture have. Hey there! Thanks for the virtual high five! Just discovered your blog through this article. Love that you said you couldn’t do without your sewing machine. Hi Lynn! Welcome 🙂 It is pretty crazy what you can accomplish by sewing a straight line! I’m so glad you are here and I hope you find lots of inspiration. I saw the article in BHG and was wondering where did you get your garden stool? I’ve been trying to find a more narrow one and yours looks like it would work. Hi Angie! That garden stool is from World Market. They have it again this year and I think it comes in a few colors. Anyhow, it made me feel proud to know them and so happy for them. But secretly I said, “me too, I’m next” That is why I can say wholeheartedly how excited I am for you and I want you to share it with my readers! Hope you will. You (and your readers) are invited to a party! 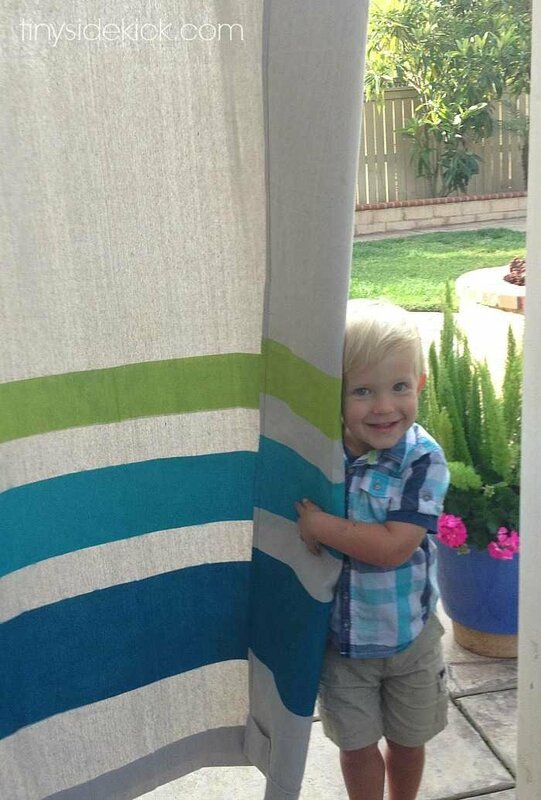 As I was flipping through my BH and G, I was asking my friend if she has seen any inexpensive outdoor curtains and as I get to the last page, there were yours!! It was meant to be. Just measured outside – can’t wait to make mine. Would rolled on wall paint work? Hi Barbara! Isn’t fate great? I can’t say that wall paint would work, since I haven’t tried it, but I would definitely use something that says outdoor use. I’d love to see them when you are done, so be sure to send me a pic! Congrats on a goal achieved! 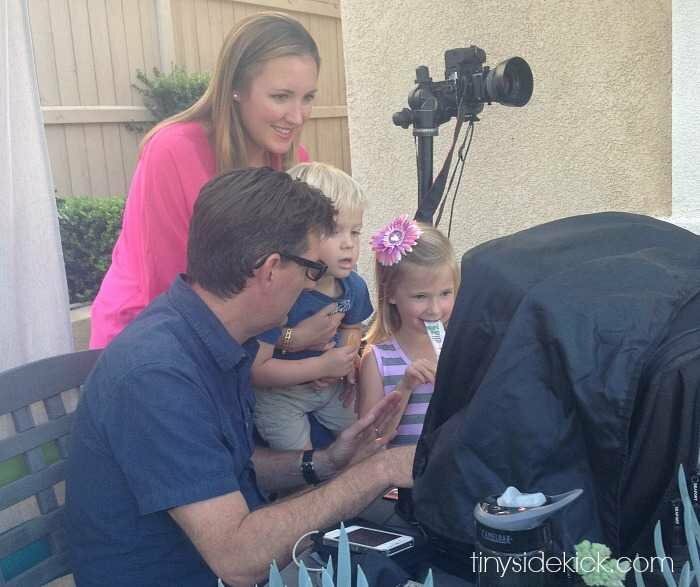 This is awesome and thanks for sharing the behind the scenes experience. Your outdoor patio looks great! this is so awesome!!! congrats! i’m not a….wasn’t a blogger, until i found yours. I love seeing what you do. Being in the middle of a remodel and loving to put things together myself your helpful hints and a peek into another creative mind has helped tremendously. thanks for your hard work….and high five girlfriend!!!! I love your patio and story in BHandG. 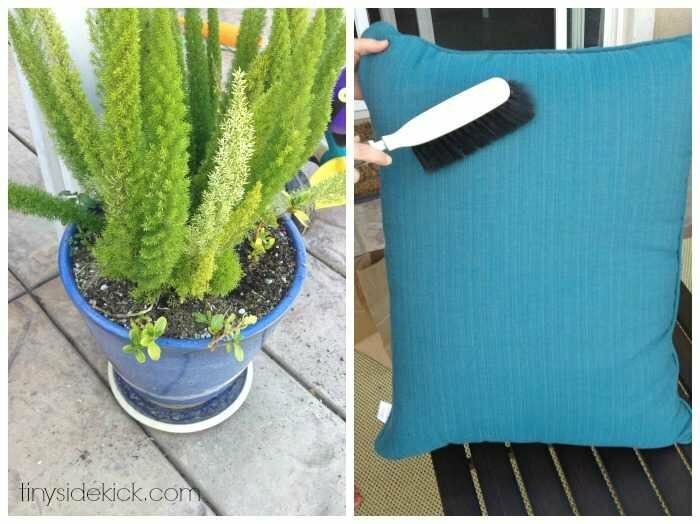 Can you share where you purchased your black chairs and turquoise cushions? Thanks! Hi Candace. Thanks so much! It was such a cool experience. The outdoor furniture is from Lowes. They still have it. It is the Gatewood collection. You can read a bit more about it in this post. http://heytherehome.com/outdoor-living-room-update/ Let me know if you have any more questions and I’ll do my best to answer them. I’m so excited and proud of you Corey! It was really fun to read all of the behind the scenes stuff too! Oh and I also love your new blog layout! I am so proud of you and LOVE that your creativity and passion are being recognized on such a stage and platform. You deserve it! I wish I could buy that magazine but I live in south africa and don’t get it here but at least I’ve read the article on this page. Keep up the fabulous work, you are an inspiration! WTG Corey how cool is that now scratch it off your to do list quick and wait for the next one to pop up. What a kick for you!! I had seen the article in BHG but didn’t make the connection! DUH!! I remember thinking at the time that since we were planning on redoing an old deck this summer your curtain idea was perfect!! Congrats on national exposure! So so exciting and well-deserved Corey!!! I always turn to that page first when I get my copy in the mail, what an absolute dream to actually be on it! Congrats! Congrats Corey! What an amazing and ridiculously exciting accomplishment!!! Yay! This is so exciting! Congratulations! What a dream, indeed. Your kids are adorable, by the way. Congrats again! Your hard work is paying off!!!! Time to celebrate! What I really like about your site cory is that we can relate to you! You are so real and down to earth. keep up the awesome work . We love it! Wow – How cool are you? i say WAY COOL. All your hard work received the recognition it deserved. I’ve never subscribed to a better blog website about the topics you cover. 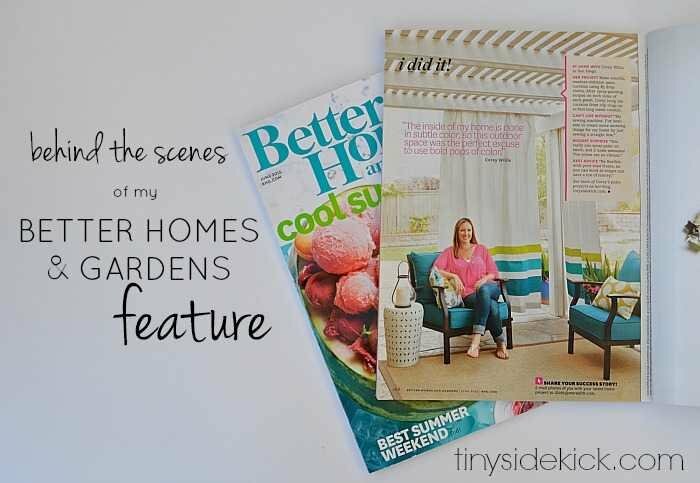 You are a standout and I’m so glad that Better Homes and Gardens recognized it and featured you. Congratulations!! Good things come to good people. Keep up the great work! Love how you tell this fun story! Congratulations!! So awesome, Corey! I will be looking for it! Wow! I am so happy for you! Way to go girl! That is fabulous! Congratulations! Your curtains did come out wonderfully! Oh my! What a fun experience! I am so happy for you! I love your outdoor space and am so happy it got featured! Haven’t forgotten about the other magazine. Just haven’t gotten around to sending it yet since I’m busy prepping for my daughter’s first communion on Saturday. That was such a fun post to read! New shoes and jewelry… hourly photos to find the best light… all so fun and fancy!! I’m really really proud of you and your hard work. So magazine worthy friend!! OHMYGOSH!!!! I’m super-excited for you, Corey! What an amazing experience!!! Oh Corey! I’m so crazy, over-the-moon excited for you! I absolutely adored your outdoor space last Summer and I’m thrilled to see it featured and in Better Homes & Gardens none the less! Eeeeeek!